GCR's no correlation with temp. Henrik Svensmark has been one of the most visible proponents of the theory that our current global warming event is caused by galactic cosmic rays. He has been successful in the past in getting his 'opinions' on the matter into documentary work. As has been pointed out in the past, physical reality does not care about opinions. So how does this idea actually hold up when weighed scientifically? However, little evidence remains for a link between galactic cosmic rays (GCR) and variations in Earth’s cloudiness. Laken et al. (2012) recently provided an extensive review of the study of the GCR and Earth’s climate, from the initial work by Ney (1959) to the latest findings from 2012. The story is quite remarkable from a point of view on public discourse and climate change – so much hype for so little (the recent excitements from the leaked IPCC drafts, a point in case). Laken et al.‘s review indicates that there never really were any strong correlations, and subsequent investigation found that those which looked interesting, didn’t stand up to scrutiny. They provide an account of the work on GCR-climate connections which I feel is well in line with the views presented here on RealClimate. 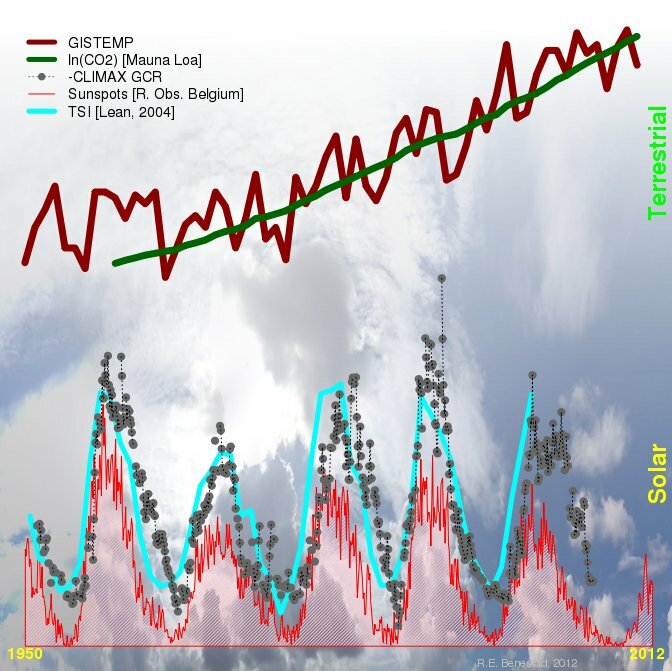 A comparison between time evolution in the global mean temperature (dark red) and different solar indices (bottom) as well as CO2 forcing (green). All the curves here have been standardised, and the solar curves are shown along the bottom. The GCR are shown in grey, and have been multiplied by -1 to emphasise the correlation with the other solar indices. In my opinion, Laken et al. provide an accurate comprehensive review of the hypothesised effect of GCRs on our climate through moderating the clouds. There is still no evidence suggesting that the GCR influence our climate in significant ways. Peter Laut found errors in their paper and published a paper addressing the corrections. When the errors are removed the conclusions and assumptions of Henrik Svensmark and Eigil Friis‐Christensen simply does not stand. 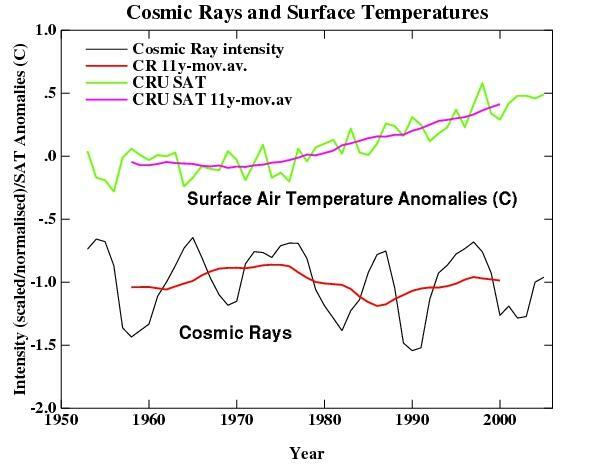 Neither changes in Solar forcing, nor galactic cosmic rays can account for modern global warming. The Laschamp Event (aka. The Laschamp Anomaly) illustrates in the paleo record that GCR's show no significant correlation with temperature. The event shows up in many paleo records so confidence is reasonably high. But Svensmark doesn't think the evidence against 'his theory' is a big problem (as indicated in 'his' book 'Chilling Stars'). The best way for him to prove it's not a problem would be for 'him' to share 'his code and method' with the scientific community. Until then, it seems it's his word against the well known shared, and discussed, evidence in the world of science. 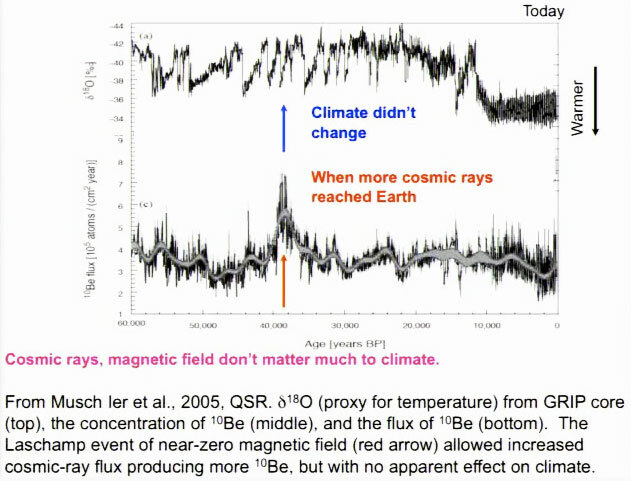 "Veizer suggests the recent global warming might be driven by changes in solar activity (his Fig. 14a – dashed line is temperature, solid line with diamonds is solar cycle length). But the figure only shows the temperature record from 1935-1990, even though of course more recent data are available. Veizer must be aware that in view of these more recent data, the scientist who originally proposed this correlation in 1991, Knud Lassen, has concluded in 2000 that solar cycle variations cannot explain the ongoing warming trend ." "In the figure below, we have superimposed the standard CRU data set (blue curve) of global mean temperature on Veizers graph." "The black line is the average of five model runs. This is not only in excellent agreement with the observed temperature changes at the surface (blue stars), it also correctly reproduces the observed heat storage in the oceans – a strong indicator that the model’s heat budget is correct. The agreement of this model with observations is particularly good and perhaps partly fortuitous, given that there is still uncertainty both in the climate sensitivity and in the amplitudes of the aerosol and solar forcings. But our main point does not depend on that and is robust: with any model and any reasonable data-derived forcing, the observed 20th Century warming trend can only be explained by anthropogenic greenhouse gases, while other factors can explain the shorter-term variations around this trend. The serious scientific discussion is about the exact contribution of each factor, not about identifying one single “driver”."